Many Duck fans are confused by Eastern Washington head coach Beau Baldwin‘s statements blasting the Oregon Ducks football program for recruiting former EWU quarterback Vernon Adams. Adams was eligible to come to Oregon using the graduate transfer rule and is currently fulfilling his undergraduate contractual scholarship obligations. 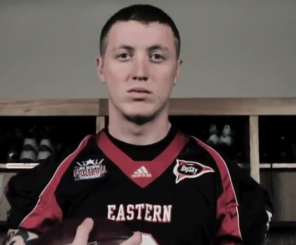 Bo Levi Mitchell transferred from SMU to EWU under the FCS transfer rule eligibility waiver. But Baldwin and the EWU football program have benefited from transfer rule exceptions and waivers in the past, making Baldwin’s criticism of Oregon’s application of the legitimate graduate transfer rule even more baffling. In 2010, Southern Methodist University (SMU) junior quarterback Bo Levi Mitchell transferred for a starting position at EWU. There is no waiting period for players transferring to the FCS. Mitchell started immediately, won the Walter Payton Award and led EWU to its first NCAA Division I FCS National Championship under Baldwin. “I know I’m going to have a chance to showcase my skills, but my window will be small, which is something I will have to take advantage of because I won’t get many opportunities. But that’s all you can ask for as a player, get a chance, seize the moment, and shine when the lights are on,” Mitchell said. 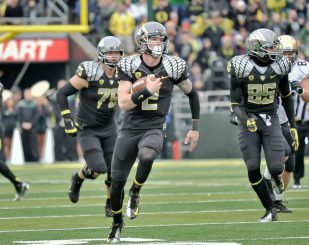 Former Oregon backup quarterback Bryan Bennett transferred to Southeastern Louisiana without a lapse in eligibility. Mitchell’s performance earned Baldwin an FCS national title and Coach of the Year awards from both College Sporting News and American Football Monthly. There are plenty of instances of FBS players transferring to FCS teams to take advantage of the NCAA’s transfer waiting period waiver, including former Oregon player and current Southeastern Louisiana starting quarterback Bryan Bennett. Baldwin’s recent comments (see Twitter post above for audio) blasting Oregon for recruiting Adams under the NCAA’s graduate transfer rule are just plain inconsistent with Baldwin’s past.